If you love baking and you’re interested in the technical aspects of baking, you may want a career as a pastry chef. Pastry chefs are extremely versatile chefs that can focus on everything from baking bread to composing fine dining desserts. A pastry chef is an expert in many types of baking and confection. 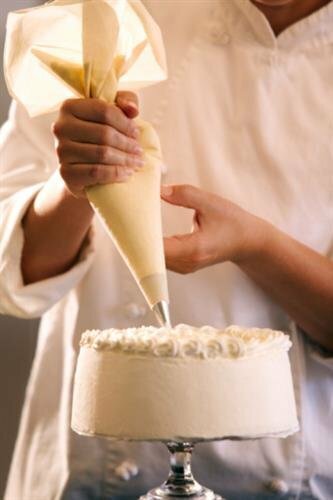 Pastry chefs sometimes specialize in pastries for bakeries or making complex cakes for weddings and other events. Some pastry chefs will work with restaurants to compose and create a dessert menu while other pastry chefs will specialize in a particular type of pastry such as cheesecake or cupcakes. Pastry chefs may also eventually become candy makers or chocolatiers, though this usually requires additional training as these tasks can be extremely difficult. According to O*Net Online, the field of baking is expected to remain relatively stable in the next decade. Pastry chefs usually require a moderate amount of on the job training, and many of them will have either a background in the culinary arts or training in a culinary arts school. A pastry chef for a fine dining restaurant or a head pastry chef will require many years of experience before they can earn the title. Until then they may be considered a baker or a baker’s assistant rather than a chef. Pastry chefs need to be dedicated and creative. A pastry chef will usually create desserts or other forms of pastry such as breads. A pastry chef will usually create desserts or other forms of pastry such as breads. The exact responsibilities of a pastry chef depend on where they work. Pastry chefs for fine dining restaurants usually have a significant amount of responsibility, as they must create their own unique desserts and train other bakers in making these desserts. They will need to prep the items that can be made beforehand and they will need to make items to order otherwise. Some pastries can be fairly difficult and time-consuming to construct. Pastry chefs that work for bakeries have a different set of challenges ahead of them. This type of pastry chef will often create pastries and confections to suit the bakery’s needs. They may need to start early to complete these pastries before the store opens. Chefs that specialize in complex cakes such as wedding cakes will need to create designs and make complex items to order. Those more interested in making candies and confections will have additional responsibilities. How Do You Become a Pastry Chef? Most culinary institutions have programs specifically designed for those interested in the craft of pastries. These programs are usually about two years long and offer comprehensive training regarding the techniques pastry chefs are expected to know and to excel at. However, knowledge alone is not enough to succeed as a pastry chef. The Reluctant Gourmet highlights many paths required to become a true pastry chef. A true pastry chef is required to have both knowledge and talent, as the field requires creativity. Pastry chefs don’t just work from recipes, but also need to make their own signature creations. To become a truly great pastry chef, a chef will need to develop their unique style and flavors. How Do You Advance as a Pastry Chef? Pastry chefs can advance in much the same ways as other types of chef. A pastry chef could acquire their own pastry company or become the head pastry chef at an especially exclusive fine dining restaurant. Pastry chefs can develop their career by building a reputation within the industry, and this usually comes from being inventive and professional. A pastry chef is required to have many years of experience within the industry, and through these years of experience the pastry chef should develop their reputation and network as much as they can.